Pinner is a fast, full-featured app for your Pinboard bookmarks. Designed for all users of Pinboard, you can browse, edit, read, manage, and much more. 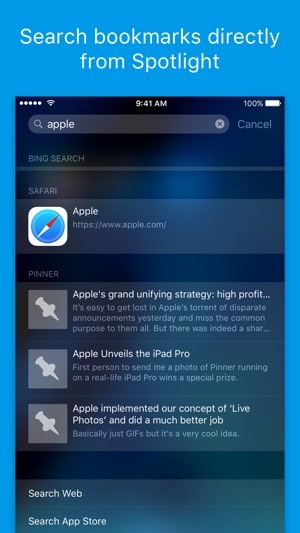 Pinner has cutting-edge iOS integration including Share Extensions, Spotlight Search, Today Widgets, 3D Touch, and more. Create a new bookmark in Pinner from anywhere you can share a URL or web page, using the two Share Extensions. Quickly save a webpage to Pinboard without ever leaving the current app. Like to automate your apps? Pinner also supports a URL scheme. 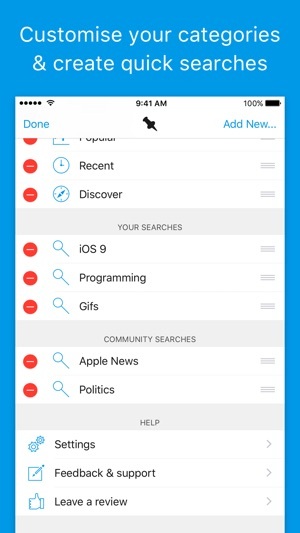 Search your bookmarks from within iOS' Spotlight Search. Universal search integration presents Pinner bookmarks alongside web and other app results. Search for a topic and find just the page you wanted, without having to launch Pinner. Add Pinner to your Today view with the two widgets. "Recent Bookmarks" shows your most recent 5 bookmarks. Add it to your Today View, or 3D Touch the App Icon. "Popular on Pinboard" shows what's popular with other users of Pinboard. Add it to your Today View to see the latest bookmarks. If you have an iPad that supports Slide Over or Split View, you can multitask with your bookmarks and even open them directly in Safari when split (enable in Settings). 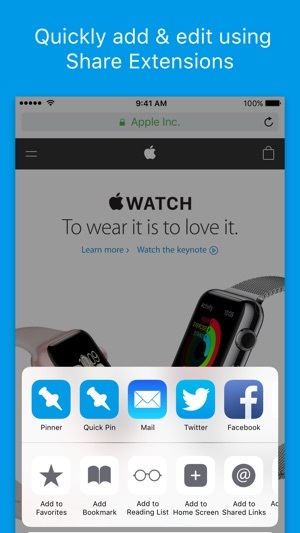 Keep reading a bookmark when switching between devices using Handoff. Transfer a bookmark directly between copies of the app running on iPhone & iPad, or send the page to Safari on devices where Pinner isn't installed - including Macs running OS X Yosemite. 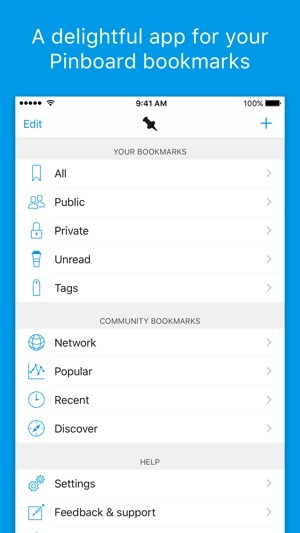 Along with your bookmarks - synced and saved to your device - browse through categories of bookmarks from other users, including Popular, Recent, Wikipedia & Fandom. Create custom searches on both your bookmarks and community bookmarks. Get fast access to your most important bookmarks & the newest ones from around the web. Filter by tag, title, author and URL. Pinner utilises Safari View Controller, meaning your bookmarks open in the familiar Safari UI with all your sessions and cookies available. Triple-tap the top bar to switch to Dark Mode, designed to be perfect for night-time reading. Choose between a huge selection of app fonts, including ones you have installed yourself. 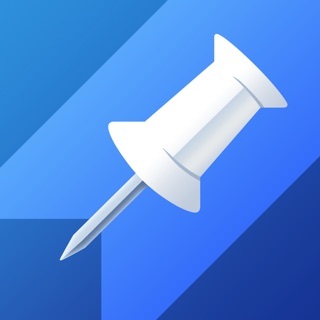 Pinner is a universal app available on iPhone and iPad, optimised for Retina displays, 64-bit CPUs, and all sizes of device. AutoLayout & Dynamic Type support means Pinner looks great on every size of device - from iPhone 4 to iPad Pro. Use del.icio.us, Pocket or Instapaper? Give Pinner & Pinboard.in a try! It's flexible enough to be used to archive all your bookmarks forever, or just as a read later list. Follow @pinner_app on Twitter or visit blog.pinnerapp.net for news. Pinner requires a Pinboard.in account for online syncing functionality, but can be used without sign up for local bookmarking. 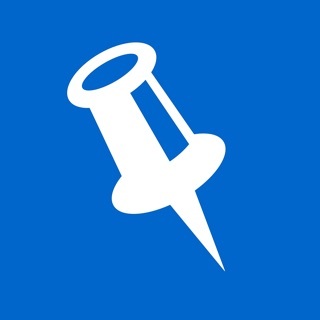 If you like Pinner, please take the time to rate and review: it really helps! • Added two new Today Widgets! • "Recent Bookmarks" shows your most recent 5 bookmarks. 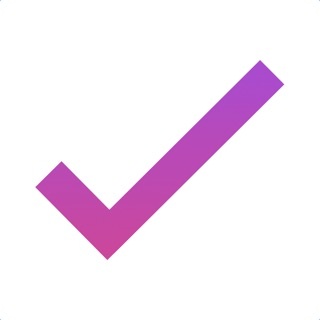 Add it to your Today View, or 3D Touch the App Icon. • "Popular on Pinboard" shows what's popular with other users of Pinboard. Add it to your Today view to see the latest bookmarks. 10/19 update: Now that Pinner has been updated, it no longer crashes on launch, so it’s once again the definite app for Pinboard. Unlike other clients, it doesn’t just punt the rendering of the optimized view to Safari’s Reader stylesheet, it renders inline. 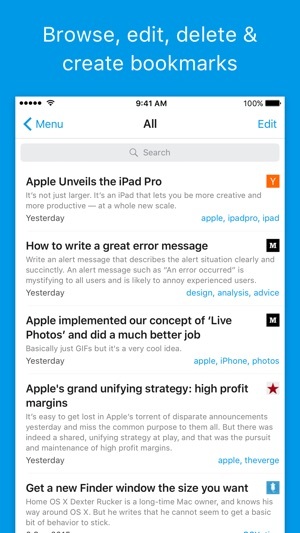 Pocket’s distraction free view still looks better, IMO, but If you’re like me and keep your read-later queue in Pinboard, this should be your go-to app. Until three weeks ago this was my most used app. Then it started crashing on launch—every single time. Pushpin had the exact same problem, but fixed it this week with an update. The Pinner dev has been unresponsive to queries about this issue. I don't give it one star out of disgust, but because in its current state it's completely unusable. It crashes within 20 seconds of launch unless the phone is switched to Airplane Mode, which of course prevents the downloading and refreshing of bookmarks. An unrelated issue, just for the record: the Kindle version, which doesn't crash like the iOS version, only renders blank pages for articles switched to Optimized view, which defeats the purpose of using a Pinboard client over the Pinboard website. The last version was good, so I don't know if it's just some new bugs to iron out or what-- this version feels very sluggish. iPhone6s 128GB + iOS10.0.2. Clicking around there is a very noticeable lag (1-3 seconds) to flip between lists of bookmarks, execute searches etc. Also I've found that if you edit bookmarks outside of Pinner, the changes are not reliably refreshed in the app (not even with pull-to-refresh) until you force quit the app and reload it. Often when using the Share Sheet extension, the list winds up showing duplicate bookmarks etc. I hope this can be fixed up because aside from that this is a great pinboard client. I rarely write app reviews but I felt I should on Pinner. I recently discovered Pinboard on the desktop and I love how I can easily manage all my bookmarks from any browser on any computer. I also frequently browse from my iPad and was looking for a solution to access the same bookmarks. Not only can Pinboard do that but it also allows me to easily create new Pinboard bookmarks directly from either Safari or Chrome on my iPad. Pinner solves what I was looking for and is well worth it!